Skill Lab: Science Detective explores cognitive skills at different levels. In the game, we use the principles of task analysis in human problem-solving to systematically and procedurally evaluate the use of different cognitive skills in problem-solving, how these skills interact, and how they are presented in each of the tasks. To answer some of the questions you may have about the mechanics of the game, how and what data we collect and how we use it we have created an FAQ to help you navigate the research taking place in the game. Is a citizen science approach reliable in social and cognitive science? Researchers need people to participate in their experiments. In the social sciences, researchers often work with small pools of participants with low variability, sometimes relying only on laboratory studies. This has resulted in researchers having a very good understanding of how a particular group of people behave under a particular set of circumstances but fails to provide information from the broader population in everyday contexts. At ScienceAtHome, we want to democratize science and draw upon a wider pool of participants to improve the quality and generalizability of our research. Such an approach is also an opportunity to communicate science to a wider audience. We are aware that introducing social science studies to the “wild” reduces the control of variables and noise. However, with the citizen science mission, we believe that a sufficient amount of people from all demographics can be mobilized to overcome these issues and deliver more general insights into human nature. Given all the methodological challenges we will face, we see our Skill Lab: Science Detective game as the first, modest step into this new direction for conducting social science on a massive scale. Due to the attention in the media, AI research has become a very broad envelope of research topics. Within the field, there is a growing awareness that humans have unique ways of processing large amounts of data very efficiently in situations where quick, intuitive responses are required. This has led to an increasing focus on understanding human decisions, actions, and interactions. One dream within the AI community is to discover “the secret of human data processing” and put this in the form of algorithms for the next generation of AI. However, the more closely we examine the human mind, the more complexity appears, so this “dream” may not be very feasible. Instead, many researchers (including us) believe that we should focus on learning more about the intricacies of humans, not in order to replace them, but in order to better understand how we can generate digital interfaces between human and algorithms that make optimal use of both. We call this hybrid intelligence. We believe that the challenge for the future lies in knowing our human strengths as accurately as possible in order to help shape the best possible future for all. ScienceAtHome is a diverse team of scientists, game developers, designers and visual artists based at Aarhus University, Denmark. We create fun scientific games, with the aim of revolutionizing scientific research and teaching by game-play. We are using your data to learn how different people solve problems and make decisions. This data enables us to create cognitive maps which can help in understanding individual behavior, group interaction and address societal questions in general. We also hope to use this data to develop hybrid computation algorithms to solve problems more efficiently. This could allow us to solve problems currently too complicated for humans or computers to solve alone. Is my data going to be used for advertising or commercial purposes? Not at all. Your data will only be used only for research purposes. Only the scientific team at ScienceAtHome who are directly related to the data will have access to it. ScienceAtHome may collaborate with other faculties, professors, or students in the future. In that case, our collaborators will be allowed only to a pseudonymized version of the data, and only to the data required to answer their research questions. What is your ultimate goal in gathering this data? 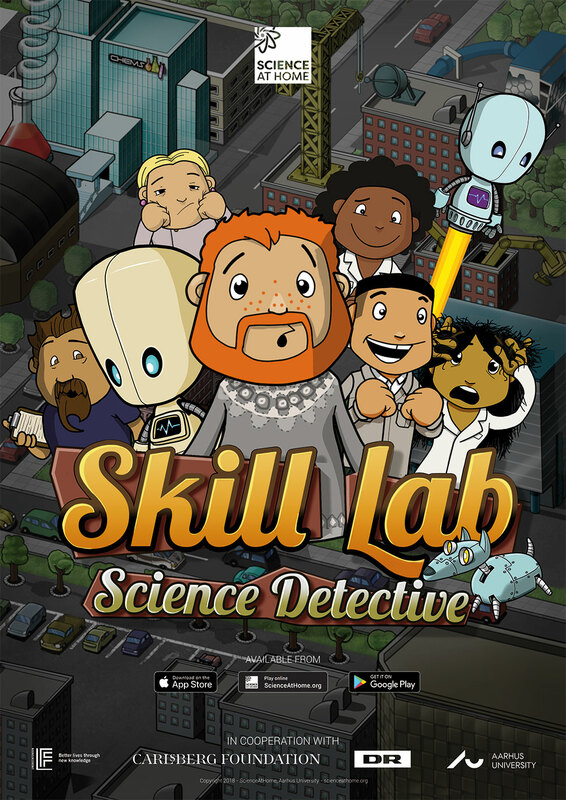 We have two goals in mind when creating Skill Lab: Science Detective. The first goal is to understand how people make decisions and solve problems, which can help us understanding cognitive skills, how they develop, and how they interact, as well as how people interact in groups, and which group dynamics are more efficient. Also, we want to optimize algorithms used to solve complex problems such as cooling down atoms, understanding turbulence and finding novel ways of solving scheduling tasks in complex networks (often from the technical, natural sciences), and our citizen science research has shown that humans are surprisingly good at this. We want to dive into these citizen's cognitive maps, in order to understand what people are doing and how this info can be used to optimize computational algorithms. What exactly is cognitive mapping? Cognitive mapping is a technique where a ‘map’ or a ‘blueprint’ is created of how you use different cognitive skills based on the different ways you solve problems. It works in a similar way to some psychological tests, but this technique relies on your actions while solving problems rather than your answers to standardized questions. How can the cognitive map be used? At ScienceAtHome we will use cognitive mapping to help build a model for understanding how people solve problems and make decisions. This can help us to generate a better understanding of human mind and how cognitive skills interact with each other, as well as optimize the way artificial intelligence solves difficult problems. There are multiple other uses for cognitive mapping. For example, it has been used in game research to improve the user experience in games. Some psychologists use cognitive mapping for career assessment. In certain cases, it is even usable for target marketing. At ScienceAtHome we will only use your data for solving scientific questions about the mind, the society, Artificial Intelligence, and to improve the player experience in our own games. When can I view my personal cognitive map? Your cognitive map and player persona (the type of detective you are) will be automatically unlocked once you have completed your ScienceAtHome User profile, and either completed the story behind Skill Lab Science Detective or played every game located in a lab three times or more. Can I compare my cognitive map with my friends’ map? The cognitive map supplied to you in Skill Lab: Science Detective is specially tailored for you, which means that it is based on your own strengths and weaknesses without comparing it to the general population. You can compare it with your friends or other people, but it will carry little value; apart from you being able to see the strengths and weakness of your friend and for them to know yours: It will not say if you are ‘better’ than someone else, or vice versa. Are there any risks to cognitive mapping? Cognitive mapping is not risky in itself, but it can be misused. For example, if a person not familiar with the theory behind the map uses the data provided by Skill Lab: Science Detective to make a psychological assessment, it might cause harm. Nevertheless, at ScienceAtHome we are not using the tool for these purposes, and our legal statements forbid the use of cognitive mapping for any type of assessment outside our scientific team. What is the fastest way to get my cognitive map? The fastest way is to enter the game and play the games located in each of the labs three times, without following the story and completing your ScienceAtHome user profile. Am I allowed to use the game for assessment? You are not allowed to use the game for group-assessment or to assess other people. The feedback provided by the games are indicators (values interpreted within a research context), that work only for yourself to have an idea of which are your personal strengths and weaknesses. They are not values directly referring to whom you or other people are unless correctly interpreted within a context. What are the scientific bases for what you are doing? We work under the principles of cognitive psychology and cognitive neuropsychology. Particularly for Skill Lab: Science Detective we are using Citizen Science as a participation technique, and the principles of ‘stealth assessment’ and ‘evidence-based design’ to create cognitive maps. Similar projects have adopted these techniques in games such as ‘Crayon Physics Deluxe’ and 'Sea Hero Quest'. What is the relation to the British brain training experiment organized by BBC in 2009? There is no relation to the brain training experiment or any other brain training apps in the market. Different types of research have proven that brain training video games are not effective to train general skills, but the proficiency in solving the specific games. Because we know there’s no relationship between playing the games and general skill training (this relationship is also called transfer), we cannot claim that our games will help your general skills in any way. When will I get my Player persona? Your player persona (the type of detective you are) will be automatically unlocked once you have completed the story behind Skill Lab Science Detective or you have played each of the games located in each lab three times, and have filled up your ScienceAtHome user profile. Where/when can I see my High Scores? We will make high scores available in the ScienceAtHome Hub in-game in the near future. When will I get my participation diploma? Played every game located in a lab three times or more. Completed the Validation tests in the Experimental Lab at the Skill Lab Hub. Completed the Questionnaire in the Experimental Lab at the Skill Lab Hub. Completed your ScienceAtHome User profile in the Detective Office at the Skill Lab Hub. What information will my participation diploma contain? The diploma that ScienceAtHome will award you for your participation in helping to build Skill Lab: Science Detective will contain your Player persona (the type of detective you are), and an acknowledgment of how you have helped the science behind the game. No. Intelligence or IQ is a clinical measure. We are gathering data on how developed some of your cognitive skills are and how they interact when you play games and solve problems for research (non-clinical) purposes. How much should I trust the Player persona and Cognitive mapping? We are in the process of creating and validating our models. Although we have made some early validations, the model is always developing and improving. So it might be that for starters you don’t feel that the persona or the cognitive map say much about you, or feel that they are incomplete. However, the more you and other people play, the more we can improve it. Also, in the future, we will be adding more games to expand the map of cognitive abilities we are generating.